Every Surah of the Quran starts with the “Bismillah-ir-Rahman-ir-Rahim” except Surah Tawbah. The meaning of the Bismillah in English is in the name of Allah the most merciful and most gracious. Bismillah is the first verse of Surah Al-Fatihah. The word Bismillah means with the blessing or Name of Allah. Before making any dua, recite Bismillah 33 times. Allah will listen all your dua and your dua will be fulfilled. It strengthens your relationship with the Creator of the World. Make a habit to start your day and each task of your daily life routine when you wake up, when you go into the bedroom, before starting your breakfast, before leaving your home, office or school, before starting your work at the beginning of the day and so on. You will feel yourself Allah’s help added to your life and it has numerous benefits for you. The main benefits of reciting Bismiilah that it will protect you from the Hell and also Allah will protect you from the angels of Hell. You should always eat with your right hand and recite Bismillah before starting your food. The benefit of having this is that Shaytaan does not interfere with your food. In case you forget to recite these words before starting your food and you remember in the middle, then you can utter these words, Bismillahi Awwalihi Wa Akhirihi. Bismalah is recommended at the beginning of ablution, for Imam Ahmad and the Sunan compilers recorded that Abu Hurayrah, Sa`id bin Zayd and Abu Sa`id narrated from the Prophet. There is no valid ablution for he who did not mention Allah’s Name in it. When you start driving, always recite these words at that time and these are very beneficial with all that hassle and danger on the road. You will feel the peaceful driving because of uttering these words just before starting your journey. If you want success in life just recite Bismillah 99 times in the Fajr prayer time. 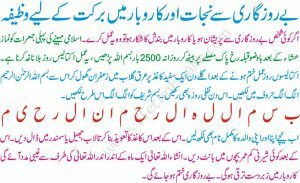 With the grace of this wazifa you will get all the success in your life. If you are facing any financial crises just recite Bismillah 786 786 times. All your crises will be solved or eliminated. If you want to increase your money or income then recite Bismillah 12000 times in a day. If you are suffering from a headache, then recite it. It will eliminate your pain. Bismillah will be extremely useful for you to get the good relation or love between husband and wife. 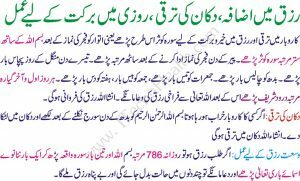 This wazifa for give you the positive result. If a student is not interested in study or would not remember the lessons. Mix Bismillah naqash in water and give to drink this water for 40 days Insha Allah with the grace of this student will begin to study and this also increase memory power. For security of house form theft recite Bismillah 66 times before going to bed, and keep its Naqsh in the house. If somebody has epilepsy, then recite Bismillah 66 times in the ear of the patient of epilepsy, do this 90 days. After maghrib Namaz recite Bismillah 199 times and pray, do this 180 days, Insha Allah it will increase wealth and Rizq. According to the Hadith, any dua which begins with this phrase will never reject. Recite Bismillah for 33 times before any dua.